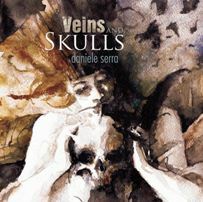 I became acquainted with the work of Daniele Serra a year or so ago via writer friends of writer friends. It was around the time he won the British Fantasy Society award for Best Artist and his images (most notably book covers) were popping up everywhere. I hadn't seen art like this before, these fluid strokes like blood or oil splashed across the canvas. Serra's work isn't just horror. It's a tangle of dystopian landscapes, grief, erotica and a quiet contemplation. Serra describes himself as a comic book artist and illustrator and if you look at his credentials you'll see he's worked for DC Comics, PS Publishing, Weird Tales Magazine and a whole host of others. I was fortunate to be able to share a place with Serra on the judging panel for 2013s BFS award for Best Artist. In my brief communication with him he demonstrated a kindness and humility one might not expect from someone of such lofty status. But this isn't a review of the artist; it is a review of the art. There's plenty to see over at his website (http://www.multigrade.it/) but viewing the work online is nothing compared to holding an actual book of his artwork in your hands, second only to owning the actual canvas. This is Serra's first solo project, published for no other reason than to display the art as it is rather than to entice the reader to delve into the contents of a book, or to accompany the text in a graphic novel. The images need no explanation and no accompaniment. They are presented in three parts. The first is a selection of colour images, nudes and skulls. Serra's women are beautiful but it is in their melancholia that beauty lies. They seem to blend into their background as though they are the city, or the cemetery or the water. They are the city made flesh, albeit a moving, morphing flesh. I wonder, too, if these women are just one side of their landscape, that of death, destruction, disease and poverty. Perhaps they are the temptresses into debauchery, with their beautiful curved forms and sinuous mouths that entice. They remind me a little of Grosz's cabaret images with a more fantasy element. Part two is a selection of simple monochrome prints in delirious profile - no background, no colour, just the vague, watery outline of the female form. I love that Serra doesn't give us the complete picture. He presents just enough, a line, a slash to create a dream-like figure that transcends physicality, and classification, as none of the images in part 2 are titled. These figures are ethereal, like ghosts or angels, and as such they inspire awe. The third section takes us back into the realms of colour, back onto the street/city where the human form is nowhere to be seen. There is, instead, an emptiness. This is the city at night; the city of the dead. It is the silence after the assault, while the blood still trickles and the fires continue to burn. These images are bound together in a beautiful (slim) hardback volume by SST Publications at the affordable price of £16.99. I would have paid more.